Why was Jesus Christ struck down by His own father? Vic Batista: Wow, what an amazing passage! That takes us back to Isaiah 52:15, "So shall He sprinkle many nations. Kings shall shut up their mouths at Him, for what had not been told of them they shall see, and what they had not heard they shall consider." Then John 3:16 says, "That God so loved the world that He gave His one and Only Son, that whoever believes in Him will not perish but have eternal life." Those verses and Isaiah 53:4 regarding the love of God are just incredible. Nathan Jones: Love is the reason why Jesus came at His First Coming. His whole life, His whole purpose, was to give up His life out of so great a love for His children. Such love and sacrifice always blows my mind! Let's make a comparison so as to understand just what Jesus had to sacrifice to bring us salvation. Picture giving up all you are as a person and becoming an ant. All your intelligence, all your abilities, all the benefits of being a human being are put aside when you become an ant. Likewise, that's what God did. He sent His Son, Jesus Christ, who was there since the beginning, who created everything, who has the power to do it all, and stuffed Him inside a womb where He couldn't do anything. God was made incarnate as a helpless baby. Also, Jesus had to grow up as a human and be surrounded by people who were evil all of the time. When you are absolutely pure, living like that can be so hard. That'd be like coming out of a shower and being surrounded by people who just crawled out of the sewer. You can imagine just how hard that'd be to deal with. Jesus temporarily gave up all freedom and use of His power so that He could suffer and die on a cross. He took the punishment that should have been ours. Our sins came upon Him and crushed Him as He suffered on the cross. He suffered so that when we in repentance put our faith and trust in Him as Savior, the punishment for our sins is transferred to Jesus. God's wrath goes off of us. Once purified, then God can look at us and say, "You are pure; you are clean. You can live with me in Heaven forever." Vic Batista: What a wonderful blessing! We are talking about the prophecies in Isaiah 53. Isaiah 53:4-5 tell us clearly why Jesus was stricken. He was wounded for our transgressions and He was bruised for our iniquities. We are all sinners, but Jesus came and He paid the price for our sins. Nathan Jones: What is sin? Simply put, sin is rebellion against God. It is an attitude and heart issue which leads us to rebel against God. We then act out against God by breaking His moral law. For example, when you murder someone, you have broken the law of the land. You must stand before a judge. Being guilty, he will say that you are condemned. That is the same thing with God. He is the judge of the universe. We have broken His moral law. We have sinned in our heart. We have murdered and committed adultery and stolen in our heart and in action, and we stand before God guilty and deserving of the punishment of Hell. Picture then Jesus Christ coming into the courtroom and being willing to go to prison on your behalf. He'll be taking the death sentence in your place. But, something you cannot do, Christ beats death by coming back to life. So, when we put our faith and trust in Jesus, that death sentence passes to Jesus. We've become exonerated and are free to go. The Judge declares that we are now innocent and we can move on with our lives and be with God in Heaven one day. Jesus did that for us. What amazing love! Vic Batista: That is an incredible love! God's gift of salvation is being offered to everyone. It's the free gift that God offers to all of humanity, but is given to those who choose to accept it. How can a person receive God's glorious blessing of His gracious salvation? We are like sheep, for instead of following the Good Shepherd, we do our own thing and forget God. Doing so has caused us terrible disasters in our lives. But, the Lord has laid on His own Son, Jesus Christ, the iniquity of our sins. Jesus took that death sentence for you. You in turn need to reach out to Jesus Christ and pray in your heart something like, "Dear, Jesus, please forgive me of my sins and be my Savior." Jesus promises that the death sentence will pass from you to His Son, and you will be forgiven. 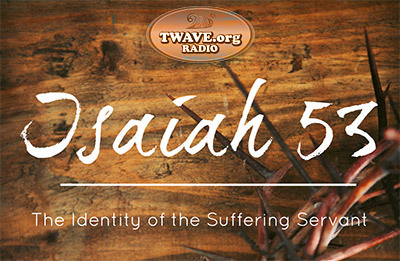 In the fifth part of our study of Isaiah 53 and the Suffering Servant, Vic and I will continue to look into the life of the Messiah as the One who lays down His life for His people.